1. Open one of the two projects you want to merge. 2. Choose Merge projects from the Project menu tab. 3. Select the second project from the dialog window, which will be in the form of an MX18 file. Because a MAXQDA project can contain only one project memo, one memo per code, and one Logbook, you can choose, in the top section, what content should be kept and what should be overwritten. When the default settings are left as is, the existing data in the already opened project will remain unchanged. In the bottom section, two options are available that allow you to determine how MAXQDA should handle documents whose identical name already exists in the project. Don’t import already existing documents – When the projects are merged, by default, all documents from the imported project are inserted into the open project. When you select this option, already existing documents will be ignored, thus not imported. For example, if the open project contains the document group “Interviews” with documents A, B, and C, and the imported project contains the document group “Interviews” with the documents A, B, and D, document D will be imported and inserted into a second document group. Documents A, B, and C will be ignored. 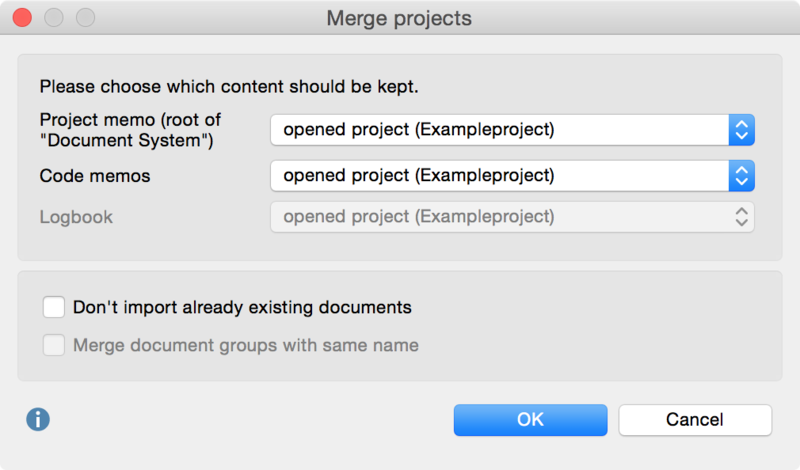 Merge document groups with same name – This option is available only when the previous option is selected. In this case, no further document groups with the same name will be created, and the imported documents will be integrated into the already existing document group. This means if the document group “Interviews” with documents A, B, and C already exists, only document D will be imported. When you click OK, MAXQDA then starts the merging process, which may take some time, depending on the size of the two projects. Please note: Before merging the projects, MAXQDA automatically creates a backup of the current project in the selected backup folder. All document groups of the imported project will be inserted with their documents, possibly generating duplicates. If a text group entitled “Interviews” exists in both projects, the resulting merged project will have two text groups of this name. The options above can be set so that already existing documents are ignored and so that no duplicate document groups are created. All memos of both projects will be inserted. Coded segments will be merged; in the case that a code or subcode does not exist in the new project, it will be created. Codes with the same name and same position will be considered identical; their color is not relevant. All internal and external links will be imported. Maps in MAXMaps will be imported and added to the existing maps. Each variable will be analyzed to determine if it already exists in the project. – If the variable does not exist in the open project, a variable of that name will be created. The variable values of the documents in the open project will be set to 0 or to the preset missing value for numerical variables, or empty for text variables. – If a variable exists with another type declaration, it will be created. Suppose the open file contains the text variable “marital status” and the file to be added contains a numerical variable of the same name. The result is that after import two variables entitled “marital status” will exist; for the old project the numerical variable will be set to 0 and for the new project the text variable will be left blank. Codes that have been transformed into variables will be ignored.